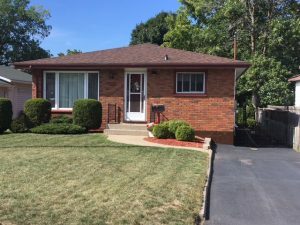 Beautifully maintained brick 2 bedroom bungalow with potential for a 3rd bedroom in finished basement. This home has been looked after and it shows. Landscaped lot with curb appeal and a park-like backyard complete with large patio and a water fountain. Even a large shed for storage tucked away in the corner. Completely fenced rear yard. Great location on Trenton’s West side. Close to Hanna Park, the hospital and downtown. Shingles new in 2018, natural gas furnace new in 2011, central air, central vac (does not work). Single paved driveway. All appliances included. Don’t wait too long, this solid home won’t last long. Any offer received are to be presented September 16th, 2018 at 2:00 PM. Dundas Street West to Dufferin or Film Street, South on either street. McGill runs East/West and is about 3 blocks south of Dundas Street. #140. Sign on.